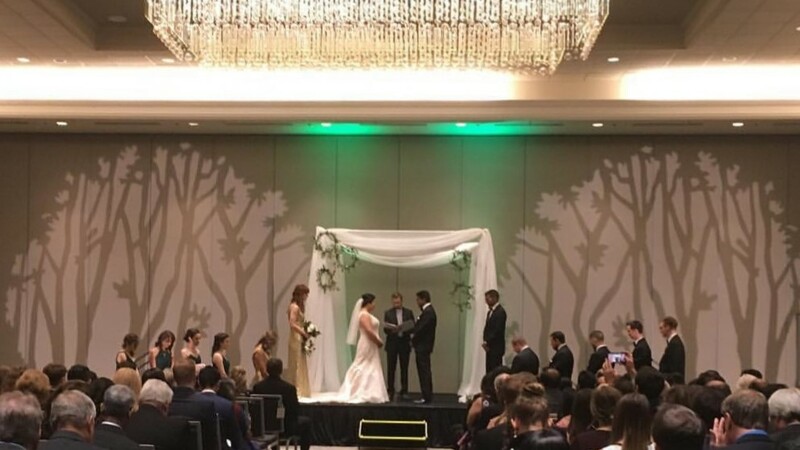 AV for You provided lighting rental equipment for a dual ceremony wedding at the Hilton in Downtown Minneapolis. For lighting rental equipment we set up our gear for the two ceremonies as well as the reception. At the ceremonies we set up three American DJ Flat Pars behind the stage. We also set up custom gobos and used our ETC Source Four Lights to shine them as background decor. At the reception we set up thirty Eternal Lighting Cube Echo LED Battery Powered Uplights. We utilized our ETC Smartfade Lighting Board to control the lighting at this event.